Canine Supplements by Pet Health Labs, Inc. Your dog deserves healthy supplements that are made with the same quality as their pet parents receive and thanks to Pet Health Labs, that is now available! The inspiration for creating Pet Health Labs came from our experience when our beloved shih tzu, Baxter, was diagnosed with cancer at age 5 and sadly passed away a year later. The news the veterinarian delivered to us that November morning was shocking – especially due to the fact that Baxter was a fairly young, energetic and a seemingly healthy dog. Little did we know that this heartbreaking experience would change our lives and our business forever. As founders of Pet Health Labs, we have over 50 years combined experience in the nutritional supplement industry. From raw material suppliers, and contract manufacturers, to developing unique liquid formulas for many branded products. Our many years of experience proved invaluable as we embarked on a quest to develop the highest quality liquid supplements designed to provide excellent health benefits for your special pet. Vitamins-Minerals-Nutrients – Our formula provides 11 essential vitamins, 10 major minerals, 72 Trace Minerals and nutrients including Lutein, Coenzyme Q 10 and a full range of Amino Acids. Immune Support – We add a proprietary blend of specially prepared botanical extracts, chosen to enhance your pets Immune System. Joint Health – As your pet ages, stress and injury can cause wear on the joints that leads to an inflammatory reaction, causing joint discomfort and pain. Our formula contains a Collagen Complex that specifically helps your dog’s joint health. Superfruit Antioxidants – A power packed blend of Superfruits that contain exceptional amounts of antioxidants, anthrocyanadins and by nature have high ORAC values (Oxygen Radical Absorbance Capacity). These properties are very beneficial to the overall health of your pet. DHA Omega 3 (from Algal Oil) – The use of fatty acids (DHA Omega 3) is designed to enhance disease free interval, survival and quality of life. 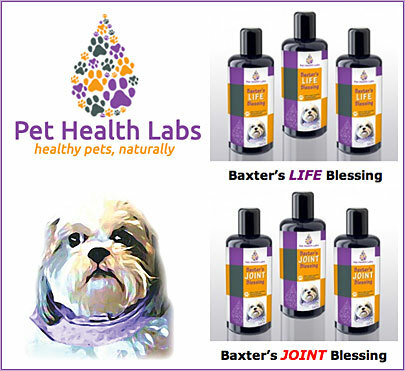 This highly specialized DHA is added to Baxter’s LIFE Blessing to strengthen your pet’s resistance to disease. The reduction of pain and inflammation of your dog’s joints. The repair and rebuilding of cartilage. Improvement of your dog’s mobility and flexibility. Halting of cartilage and bone erosion. Promotion of long-term joint health. How Does Your Products Compare To Other Brands? Pet Health Labs products are made with the utmost attention to quality – compare to other brands - our uniquely formulated products and quality ingredients are superior to anything on the market. Concentrated formulas are used to provide the highest potency of the ingredients your special pet needs for optimum health - and without added water and fillers. We know you will find out products exceptional in every way! Why Are Pet Health Labs Products The Best Choice For Your Pet? 100% Human Grade Ingredients – The highest quality available! No Artificial Ingredients - flavors, colors, fillers, wheat, yeast or dairy. Concentrated Nutrition – Our highly concentrated formula that is not diluted with a large amount of water and other fillers. The product delivers the potent nutrients your pet needs and nothing more. Premium Packaging – Our products are packaged in a specially designed and manufactured violet glass bottles. This bottle protects and preserves the product and therefore, ensuring a fresher, more potent product. Absolute Quality – Quality is a thread that runs through everything we do at Pet Health Labs. Our ingredients are the finest available, validated by independent testing laboratories so your pet will always get what you expect – nothing less. Our products are manufactured in a certified, licensed facility to meet all standards of cGMP (Current Good Manufacturing Practices) and made in the USA. 100% Satisfaction Guarantee - We know you and your pet will LOVE our products! Why are your Formulas Liquid and Concentrated? Our research has shown that many dogs do not like to take pills or powders no matter how you cover them up. Studies have shown that liquid supplements assimilate 90% faster than pills or powders, therefore, delivering a higher percent of the active nutrients. Also, our formula has a natural flavor that is pleasing to the canine palate. Our highly concentrated formulas contain all the ingredients in a powerful blend – they are not diluted with large amounts of water or other fillers – they deliver the potent nutrients your pet needs for ultimate health! How Do I Feed Your Supplements To My Dog? It is easy to feed Baxter’s formulas to your dog. Simply shake the bottle, open and pour the recommended dose on your dog’s wet or dry food and mix. Your dog will love the all-natural flavor while getting the extra nutrients he needs! Our concentrated formulas offer great value. Each 200 ml bottle of Baxter’s Formulas contains 40 teaspoons of liquid. For dogs and puppies less than 10 pounds, give 1/2 teaspoon daily. The bottle contains 80 doses and lasts almost 3 months! For dogs 10 to 60 pounds, giving the suggested dosage of 1 teaspoon daily, the bottle will last for 40 days! For larger dogs, over 60 pounds, giving the suggested dosage of 2 teaspoons daily (divide between morning and evening feedings) the bottle will last for 20 days! Many pet owners report that they see results in their pet in as little as two week. Since the effects of Baxter’s formulas are cumulative, they should be given for least one full month. The longer you keep your dog on the product, the greater the potential benefit! When the bottle is unopened, it should be stored in a cool place, out of the light. After the bottle is opened, you should refrigerate. Keeping your dog healthy is the most important part of dog ownership. Processed pet foods-- even the best—do not give our pets the important nutrition and vitamins they need to maintain optimal health. Pet Health Labs products are formulated for superior immune support and joint health. For more information about our products and to place your order, please visit our website!